Flowers – keep your flowers upright without using foam. Cut a large potato in half. Use a skewer or an ice pick to poke holes for the stems. Place it at the bottom of the vase and make a super pretty arrangement! Stamp – the great thing about potatoes is how easily you can make a cute stamp! Scrape a pattern and use the stamp for art around the house, to decorate birthday bags or even wrapping paper. This is a great activity with kids. And, you most likely have all the things you need already in the house. Rust – it doesn’t make rust, potatoes can help you remove it from cast iron, baking pans and gardening tools. The potato acid dissolves rust. This is a great tip for the kitchen where you don’t want to use any toxic rust removers. Light bulb – when a light bulb breaks while being removed, simply cut a potato in half. Stick the flat end into the socket, turn and pull. You’ll remove the broken part safely. Compress – ever notice how your hot potato stays, well, hot? In need of an ice pack or a hot compress, consider using a potato when no other options are available. It will keep the temperature you need for a while. 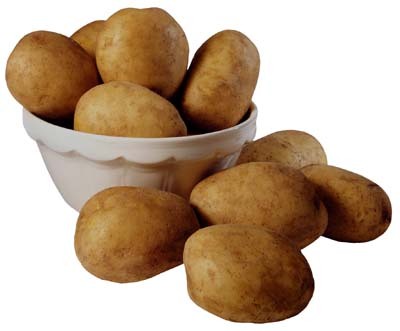 Tarnish – remove tarnish from silverware by soaking them in potato water for an hour. After, simply wash as normal and they’ll be super pretty again.